Upon arriving in Jordan, I was anxious to get started on my third series of projects with Syrian refugees in the past year and a half. 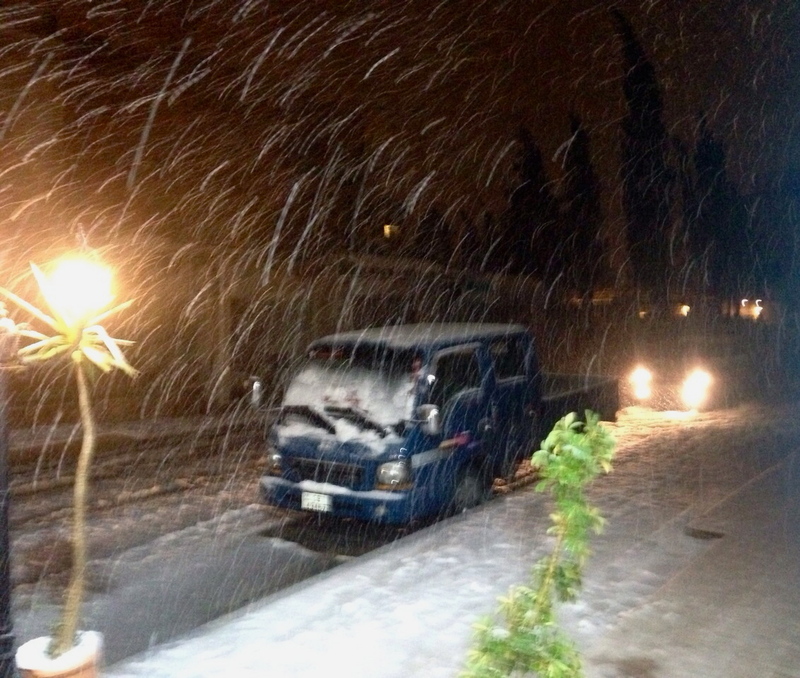 But the weather had other plans for me; the night of my arrival, the region was engulfed in a rare snowstorm and I spent days waiting for the country to thaw. While it seemed impossible for me to escape the cold—buildings in Jordan are generally made of cinder blocks that have no insulation and no heating beyond space heaters that don’t seem to fill a room, making it so cold that I could see my breath in my bedroom—I couldn’t help but think of the millions of people displaced by conflict around the Middle East, living in refugee camps and temporary settlements that I imagine are colder and much more desperate than regular housing in the capital. Child participating in the mural project. Photo by Samantha Robison. Finally the weather subsided and I once again joined forces with AptART (Awareness and Prevention Through Art), Mercy Corps and UNICEF to facilitate two more mural projects with Syrian refugee youth. The first took us a school in the Bedouin community of Za’atari Village, right next to the refugee camp of the same name that I worked in during my last two visits. 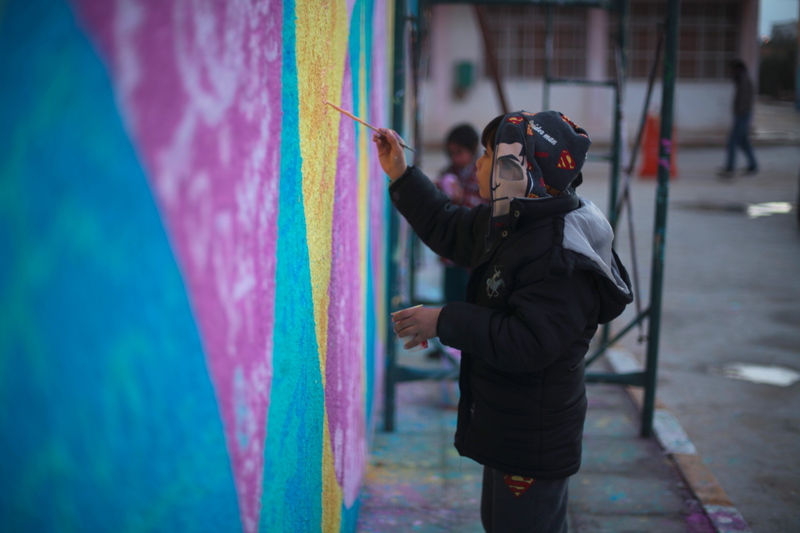 The project aimed to bring together local Jordanian kids and their recently-arrived Syrian peers to participate in workshops and create a giant mural together. There has been tension and animosity in the school between these two groups, which is a reflection of the situation in host communities across the region that have all experienced massive waves of refugees fleeing the Syrian Civil War, putting intense strains on local resources, social services, employment and housing. The kids and teenagers discussed the importance of unity and cooperation between the two populations in their village, and expressed their ideas through writing and paintings on the wall. A Syrian teenager expresses her dreams in the water of this mural in Azraq refugee camp. For our second project, we headed to the Azraq refugee camp, where we painted a mural in an “Adolescent Friendly Space” run by Mercy Corps. We organized workshops with teenage boys and girls in which they explored their lives in Syria, how their goals and outlook on the future has changed due to their displacement, and what they dream of for their lives and for their families and nation. The mural features a boy fishing off of his camel, with the words “One day I will catch my dream” behind him. His fishing line goes into a pond on the cement floor of the space, where each participant painted their own fish filled with images and words that reflected their hopes for the future. While this visit was much shorter than my time here last year, I once again learned a great deal from our community partners and the kids, whose resilience and upbeat spirit in the face of such unspeakable violence and pain always surprises and moves me. I hope to continue to have the opportunity to come to this region, improve on my Arabic and build more bridges with the Syrian people who, despite having suffered greatly, still have so much to offer and will need all the solidarity they can get as they strive to rebuild their lives and communities. Workshops focused on building connections between the two communities. We were invited to an amazing meal at the home of a community leader in Za’atari Village. Girls in Azraq Syrian Refugee Camp attend a workshop focused on their goals for their lives and their hopes for the future of their community.